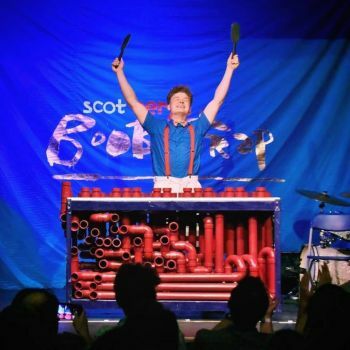 Snubby J is an LA-based musician and creator known for his performances with the RimbaTubes, a homemade PVC Pipe instrument built with his father in 2007. What started as a hobby making YouTube videos, has since brought in over 400,000 followers and 200 million video views worldwide. Originally from Portland, OR, he has performed internationally and on television programs including ABC’s The Gong Show, Germany’s Das Supertalent and TEDxTalks online. Through his high-energy performances, Snubby J aims to create work that’ll bring light into people’s lives in a fun and meaningful way. This is his first time at Moisture Festival … we think you’ll love this.